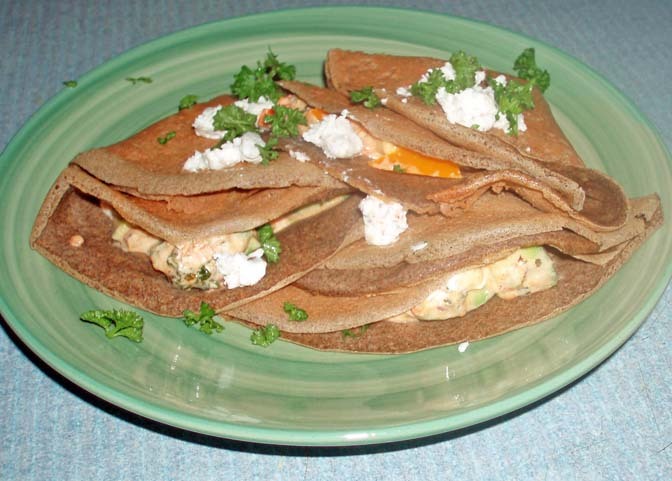 Crepes are a quick, easy, and elegant dinner idea. Mix all ingredients together. I find this is most easily done using a blender, but you can add everything to a bowl and combine with a wire whisk if you prefer. The batter will be very thin for a delicate crepe. If you have a crepe pan follow the heating directions that came with it to prepare for cooking. A regular skillet can be used also. Heat the skillet over medium high heat, add enough fat (butter or olive oil) to cover the bottom. Remove the pan from the heat, pour in about ¼ cup of batter, swirl to cover, and return to the heat. The crepe will quickly appear dry on top and will be golden on the bottom, about 30 seconds. Tip the pan and the crepe will fall out onto a plate. Cover with a cloth to keep warm while cooking the remaining crepes.